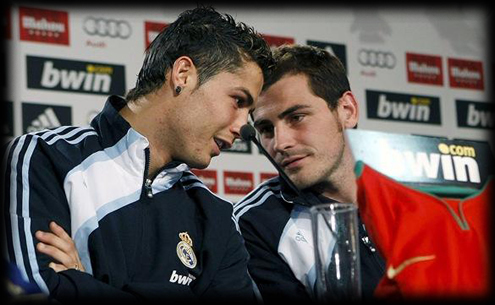 26.03.2011 » Casillas: "Cristiano Ronaldo deserves more respect from some fans"
Iker Casillas, who usually just focus on defending Real Madrid goal line, recently also defended both Cristiano Ronaldo and José Mourinho. The Spanish captain and goalkeeper asked for more respect towards the Portuguese duo, who keep being insulted througout several Spanish stadiums and demanded fans to show more respect and "education". Still regarding the many offensive insults that have been directed to some Real Madrid players and staff members, Iker Casillas said that he understands that sometimes the fans can get very excited in a football match, but he adds that both José Mourinho and Cristiano Ronaldo deserve a lot more respect and "education" from fans. The Real Madrid captain and goalkeeper, doesn't accept the way some fans around Spain keep treating some of his club teammates, in particular CR7. Casillas: "I understand people go to football stadiums and try to forget the stress and pressure from their daily jobs, and somehow try to cheer up	themselves, but it's urgent that they start showing a bit more education towards Cristiano Ronaldo or José Mourinho for example." Iker Casillas also remarked that he believes José Mourinho to be one of the best coaches in the world. The Spanish goalkeeper said he'll defend Mourinho from all the critics that may happen in the future. Casillas: "He's a great coach, probably one of the best in the World right now. I didn't know him as a person, only as a manager. Now that I know him better, since I'm with him for around 24hours daily, I will always defend him from whoever attacks him." Don't forget that you can watch Portugal vs Chile livestreams, online here on ronaldo7.net later on, even though Cristiano Ronaldo won't play.